Most of the raccoon skins sold in the world have been highlighted for the fashion industry when they are tanned. This process gives the skins and tails a bluish tint. 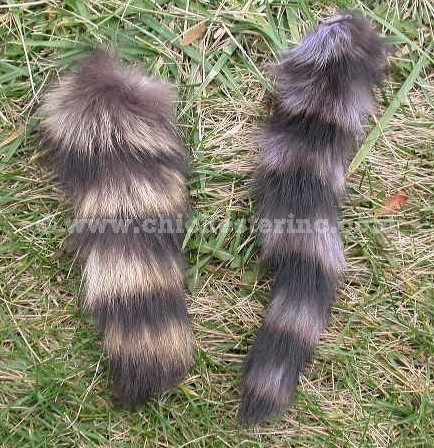 Given that 95% of the skins are highlighted, these are the most commonly available and are generally what you will get when ordering raccoon tails. In the above picture, a natural raccoon tail is shown on the left and a highlighted or tinted tail is on the right. Click on the picture for a larger view. PLEASE NOTE: Particular sizes and grades may not be available at all times. Due to the nature of these items, it is almost impossible to order one particular size and/or grade. If you cannot wait for your requested size/grade, please ask our staff for other available options. Genus and species: Procyon lotor. Wild. Raccoon are not an endangered species. 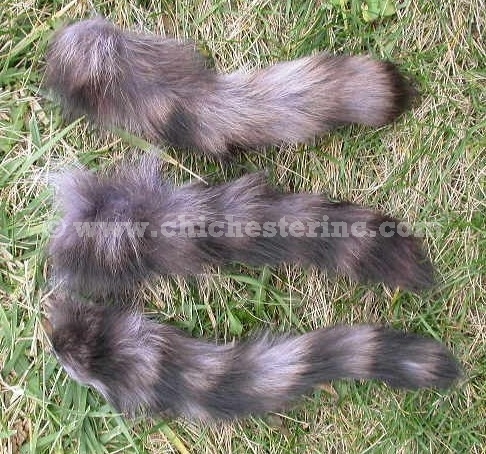 To see the other types of raccoon tails we offer, click HERE. We make the raccoon tails into keychains for an extra US$5.00 per tail. Just let us know if you want a key chain. We use nickel key chains. If you prefer, we can use a tan or black leather strap instead of a key chain. Click HERE for more Raccoon Tails. Click HERE for other Animal Tails. Click HERE for Raccoon Skins. Click HERE for Raccoon (Davy Crockett) Hats.